On 5 February 2000, Russian soldiers summarily executed dozens of civilians in the Chechen village of Aldy. Survivors of the massacre have no hope of finding justice, with the authorities doing everything in their power to whitewash this and other tragedies. 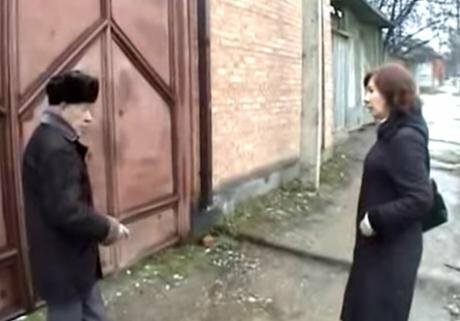 A still from documentary ’Aldy: No statute of limitations’ showing Russian journalist Natalya Estemirova before her murder in 2009. Source: YouTube.This Sunday marked the seventeenth anniversary of the Aldy Massacre. This is what locals call the zachistka (cleansing operation) by Russian military units in the small village on the outskirts of Grozny. About 100 civilians were killed in the operation, mostly elderly people and women, with a one-year-old boy and his young mother also among the dead. According to eyewitnesses, the security forces who conducted the "cleansing operation" in Aldy acted with deliberate intention, because virtually none of those killed had done anything at all to provoke them to such cruelty. Malika Ganayeva’s husband and two sons were killed on that day. She found their bodies, executed, on a street neighboring their own. "They were lying side by side. Apparently they killed my youngest son first. The older boy hugged his father; he covered him as they fired. Our neighbour, Khakimov, was also killed with them. I screamed with some voice other than my own. Later on, the women from the next village over told me that even they had heard my cry," she recalls. The woman found sledges and somehow the strength to pull the slain bodies back to her yard. An elderly neighbour volunteered to help her. She begged him not to leave his home, as the death squads had not yet left; he would not listen. Soldiers shot him as he pushed the sledge, right in front of her eyes. Distraught, Ganayeva added his body to the sledges. Human rights workers and journalists have collected an abundance of such testimonies. Many villagers recall even the nicknames, names, and distinctive clothing of the soldiers who attacked the village. However, this remains only in people’s memories — nowhere else. In Chechnya, the anniversary of the murder of nearly 100 citizens was not commemorated in any form. There was not even a short piece on the local TV station, much less a mourning procession or a rally demanding that the perpetrators be found and punished. The Chechen authorities have adopted quite literally the slogan ‘war without a trace’, which was at one time dictated to them by Moscow. The authorities take the view that nothing should remain in the republic to remind people of the wars. This applies to monuments and crimes such as the Aldy Massacre. Only a handful of Chechen human rights and social activists dared to even post on social media about the need to remember one of the most tragic events in the life of the Chechen people. In 2000, Russian troops conducted several "special operations" just like the one in Aldy. Hundreds of innocent civilians were killed. These occurred in Alkhan-Yurt, Staropromyslovsky District, and Oktyabrsky District. In several places soldiers organised brutal lynchings. Everything is documented in human rights organisations’ reports. According to the Memorial Human Rights Centre, these tragic events are not random episodes or tragic exceptions. In its report about the situation in Chechnya in 2000, they noted that the Russian authorities intentionally refused to investigate crimes in which defenceless civilians were killed. "In our view, this is a natural consequence of the legal nihilism deliberately displayed by the Russian authorities during both the first and second armed conflicts in Chechnya: disregard for international norms in the area of human rights and international humanitarian law, violation of Russian laws, and the lack of any desire to punish those guilty of perpetrating crimes against the civilian population," Memorial’s report says. In the winter of 2000, fighters left Grozny via the sole remaining corridor, which they believed to have ‘bought’ from corrupt Russian soldiers. In fact, it was a trap, and the fighters were driven onto a minefield. They broke through nonetheless, despite being fired upon from all sides, albeit with great losses. Some of them stopped briefly in the village of Katar-yurt. The villagers were punished harshly for sheltering them. Some time after the fighters had left the village, it was cordoned off, with no-one allowed to leave. It was then subjected to an intense artillery barrage; between 50–150 people were killed. It is unknown how many young Katar-yurt residents joined the fight after the murder of their relatives by the Russian army. In recent years, Chechen authorities have gone to great lengths to please the Kremlin. Demonstrations are organised only to please Moscow. Events commemorating the two Chechen wars, and even crimes from much earlier committed against the Chechen people in the name of the Russian government are strictly prohibited. If there is any remembering to be done, the only one with this right is Ramzan Kadyrov, President of Chechnya, who has for some time blamed only Chechens for all their misfortunes. Chechens themselves were even to blame for the Stalinist deportations, he somehow claimed in one television address. The Soviet deportations of the Chechen and Ingush populations to central Asia and Siberia during WWII are considered by many in Chechnya to be an act of Genocide, a claim recognised by the EU Parliament in 2004. The official day of mourning in Chechnya for those killed during the deportations was moved to 10 May, the day that Kadyrov’s father — Akhmat Kadyrov — was buried. Chechen society categorically rejects this interpretation. However, there is hardly anyone who can publicly express this. One such brave soul is social activist Ruslan Kutayev. Three years ago, Kutayev organised a conference to commemorate the 70 year anniversary of the deportation of the Chechen nation. Well-known historians, professors, and human rights activists participated in the event. Kutayev’s speech was striking. In it he implored Chechens to remember the tragic events in the history of their nation, so nothing of the kind could happen again. Since by gathering here people were making an open statement on such a sensitive topic, despite verbal warnings from Chechnya’s leadership, many of the participants were called in for a talk with the republic’s head. The only one to refuse was Ruslan Kutayev. He was arrested, and drugs were found on him, most likely planted there by the authorities. After a short, farcical, show trial, he was sentenced to four years in prison. A criminal investigation into the mass execution of peaceful residents in the village of Aldy was opened on 5 February 2000; the investigation has been suspended and resumed several times since then. This crime, which can easily be counted among the cruelest episodes of the Second Chechen War, remains not only unpunished but also un-denounced and unrecognised by the authorities. This article originally appeared on OC Media. Follow the OC Media team for in-depth stories from both sides of the Caucasus.